Memo to Myself: Never Try Baking Again. Ever. Do you know how sometimes you do something, and then you think, “Man, I should remember not to do this ever again”? Like, never go on a diet, because steamed mushrooms taste awful and make you really grumpy. Never sign up with a fitness studio, because you will end up going two times, but paying for the next two years. Never buy chocolate “for next week”, because you have zero self-control and enough clothes you don’t fit in anymore. Normally, I remember these “memos” very good, learn my lesson and stop doing whatever I was doing there. But there is one “memo” that my brain refuses to take seriously. A couple of days ago, I saw this amazing recipe online. No “separate egg yolk from egg white for the reason I won’t tell you”. No “beat the crap out of egg white and sugar till it becomes fluffy, but not too fluffy”. No “add water to batter till it becomes liquid, but not too liquid”. The second best part was that “the stuff” was like 5 ingredients, the majority of which I already had. These simple instructions were supposed to result in “rich, moist, and generally gorgeous looking Mexican style chocolate cake with chili flakes in it”. I thought one can train a raccoon to do that! So I decided to ignore that memo to myself about never baking again and to try “one more time”. This time I was completely sure I would nail it. Like 200%. How can I be worse at this than a raccoon? Well… Where should I start? The recipe said to use chocolate with 70% cocoa solids. So I went shopping for it and came home with… a 50% cocoa bar. Why? I have no idea. I guess this will have to remain a mystery forever. I had to sacrifice the 60% cocoa bar I had stored for eating purposes, but it made only the half of the necessary chocolate amount. I had to use 50% bar for the other half. The recipe also said to use ground almonds. I thought I had some, but I didn’t, so I ended up shredding the almond flakes. And yes, there is a difference. And the last but not least, I didn’t have chili flakes, so I decided to shred some dry chili peppers. Isn’t it how chili flakes are made anyways? But how should I decide how many peppers to shred? The recipe gave the measures for the flakes, not for the whole peppers. First, I was thinking to use only one chili pepper. But then I remembered that last night, when I made chicken for dinner and asked my husband whether it was too spicy for him, he said “no” and asked for additional chili pickles. So I thought it wouldn’t hurt if I used a bit more chili this time. You know, because chili in chicken and chili in baked goods is absolutely the same thing. Because everybody, especially men, who usually tend to have more understanding for unconventional tastes of things that are supposed to be just sweet, regularly say stuff like “I think this chocolate cake could use more chili”. I can tell you in advance, we were both very lucky that day he didn’t say it was too less garlic in that chicken. I’m afraid to imagine what kind of conclusion my brain would have reached from that statement. Oh wait, the chili flakes issue wasn’t the last part of it! Step 4: “Poor the batter into a cake tin”. Yeah… there is a problem, you see. I don’t have a cake tin! But I have that thing they bake muffins in. I discovered the missing tin problem when the batter was already ready. So I decided muffins it is. Thank God I had an oven! Not sure if I could have found a suitable substitute for that on such a short notice. Use 55% chocolate instead of 70%. Result: The amount of fat was much higher, as the “missing” 15% that was supposed to be cocoa were actually butter. Use shredded instead of ground almonds. Result: I couldn’t taste any almonds. Guess the amount of chili. Result: Oh, you just keep reading. I’ll tell you later in detail! Use muffin baking thingy instead of a cake tin. Result: the layer of batter was thicker, which resulted in… well, let’s say it didn’t help. While my muffins were baking, I could see the fat bubbling on top of them. 200 g butter. It’s almost the whole stick, people! Normally, I need a month to finish that. Plus extra butter from the “missing chocolate”. I already started feeling a bit nauseated thinking of all the calories every muffin would have. This is another reason I don’t like baking: You get to see what is inside! And this just kills all the fun. If you ask me, in case of cakes (and sausages), ignorance is a bliss. I gave my muffins a couple of more minutes, because I thought the layer of the batter was thicker that it would have been in a cake tin (yes, I can act intelligent if I want to). Then I took my creation out of the oven and let it cool down. 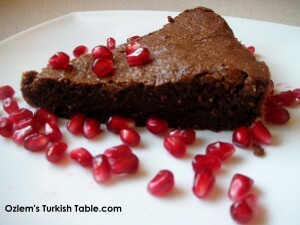 Do you think it’s pomegranate seeds? I think it’ pomegranate seeds. Otherwise it looks the same as in the original recipe. Finally, the moment of truth had arrived. I took a bite from one of the muffins. It tasted ok. One could taste the chili, yes, but not more as a slight aftertaste. So I decided it was safe to give one of the muffins to my husband, who already smelled the freshly baked chocolate goods and was asking every five minutes whether we can have some now. After taking a bite he said it was good, but there was a strange aftertaste he couldn’t identify. I said it was chili. I answered his silent question saying it was what the recipe said. (Best strategy ever: Spoiled your food? Blame the recipe!) Besides, it’s not much, I tasted it, maybe if he ate some more he would get used to the taste. The poor guy tried his best but had to leave it on his plate saying he just can’t deal with all that chili. I brought the “chicken not spicy enough last night” argument, and earned a confused look of “you cannot be serious right now”, which I decided to ignore. To demonstrate that he was just being a sissy and that it was not at all too much chili, I took a big bite and started chewing on it, simultaneously giving my “what are you talking about, this is an awesome muffin” speech. You see, I’m a really fast eater. With me, it goes like “chew-chew-swallow, chew-chew-swallow”. My husband, however, eats slowly. For him, it’s more like “chew… chew… count-till-10… chew-some-more… tell-a-story… swallow”. So when I took that very first “test bite” it was a quick one that took like a second. But when I was trying to prove my point, talking with a piece of muffin in my mouth, it started to burn, and burn for real. With every half a second the burning powers of that muffin seemed to increase exponentially. Having realized what I had done again, how I managed to screw up the probably simplest recipe ever, I got a stroke of a hysterical laughter, now really unable to swallow the muffin, which by then started to burn the hell out of me. So I ended up having food in my kitchen, which could give you diabetes, catapult your cholesterol level to the stars, and give you tongue burns just by you looking at it. That was the second time in my life when I was scared of my own food (the first time was when I made chili con carne – another long story). My husband was like, “Well, that’s a lot of left overs”. I was like, “We ate only one out of six! How is this left overs?”. And he was like, “Oh believe me, these are left overs”. Which meant “There is no way I’m gonna eat this!”. Which, in turn, meant I was completely on my own with the “monster muffins”. Well, I always had a suspicion my soft heart was more of a curse than a blessing. But the moment my heart told me that I couldn’t throw food that contains chocolate away and had to eat it now, I was absolutely sure it’s a curse. This, and that I would probably die a not-so-honorable death from diabetes, high cholesterol and mouth burns. Unfortunately, I always go where my heart takes me. I ate them all. Alone. Sometimes two a day. Often feeling that I’m going to see this muffin coming back out of me, it was so “rich”. The secret was to eat fast and to drink milk with it. And hey, I survived! Take that, you “monster muffins”! Although I still haven’t checked up with my scales. I think I’ll postpone it till spring. No, but seriously. Memo to myself: Please, never try baking again. Ever. Next post From Zero to 10,000 Followers in Two Months. A Story of One Success. Gill….Dying of laughter over here. You are supposed to leave the baking to Sam…Haven’t we taught you that yet? Monster Muffins?!?! This is classic! 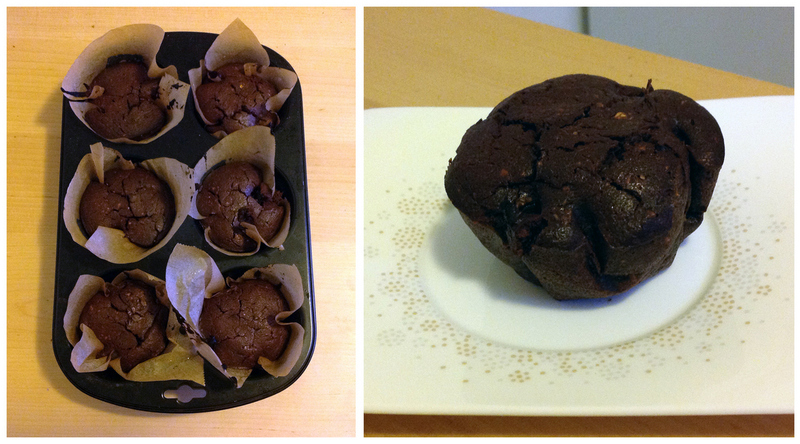 And 2 muffins in one day…leave the scales until spring for sure! Haha! After a long time I am laughing out load by reading your post… so hilarious 🙂 Thank you Gill ! I was laughing so hard my husband came to inquire wheter I was reading stuff about myself again – yes I was! That is just how I cook! Happy to be responsible for making you laugh, Kitty. I reread this post again after a long time today. Good times! ?